DEATH BY CHOLERA. Likely originating on the Indian subcontinent in ancient times, cholera was one of the most widespread and deadly nineteenth-century diseases, killing tens of millions in Asia and Europe. Cholera victims experienced high fever, extreme diarrhea and vomiting, rapidly became dehydrated, and often died. The bacterial cause of an 1854 cholera pandemic in Florence was first identified by the Italian anatomist Filippo Pacini, but his findings were ignored by the medical community, which preferred subscribing to the traditional miasma (“bad air”) theory of disease. In 1883, the bacterium Vibrio cholera was rediscovered by the German bacteriologist Robert Koch, who established the germ theory of disease in 1890, despite being unaware of Pacini’s earlier finding. The bacterial cause of cholera was now accepted. Italian pathologist Eugenio Centanni showed that while this endotoxic substance was released from some Gram-negative microbes, it was never associated with Gram-positive bacteria. In 1935, lipopolysaccharide (LPS), part of the outer cell membrane of Gram-negative microbes, was found to be the trigger for the endotoxic effects in such infectious disorders as cholera, salmonella, and bacterial meningitis. LPS is now used synonymously with the more historic designation endotoxin. SEE ALSO: Miasma Theory (1717), Gram Stain (1884), Germ Theory of Disease (1890). During the First Balkan War (1912–1913) between Turkey and the Balkan league, the Turkish army was ravaged by a cholera epidemic that caused 100 deaths per day. 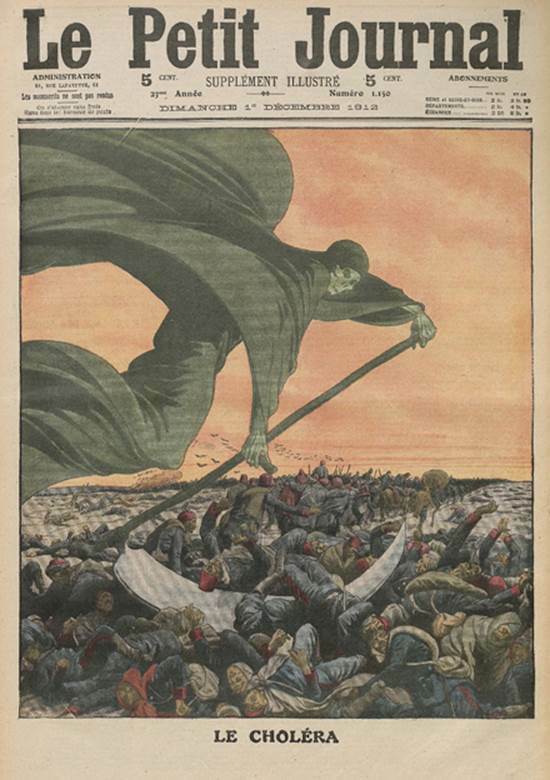 This image from a 1912 French magazine shows the grim reaper decimating a column of Turkish soldiers.